Fifty years ago, Morris H. (Morrie) DeGroot became the founding head of Carnegie Mellon University’s Department of Statistics. To honor his legacy of building the foundations of a world-class statistics program and his influence on the theory of rational decision-making, the Statistics Department has invited Nancy Reid to give the 2017 DeGroot Memorial Lecture. Reid, University Professor of Statistical Sciences and the Canada Research Chair in Statistical Theory and Applications at the University of Toronto and internationally acclaimed statistician, will discuss "Distributions for Parameters" on Thursday, April 20 at 4 p.m. in Posner Hall’s Mellon Auditorium. Her talk will reflect on foundational thinking in statistics and inference under uncertainty with special attention to issues that arise in the context of big data and data science. She will provide an overview of approaches such as confidence distributions, generalized fiducial inference, inferential models and belief functions, with a specific focus on common elements and calibration properties. "The Department of Statistics could not think of a more distinguished and thoughtful statistician to honor Morrie’s legacy than Nancy Reid," said Joel Greenhouse, professor of statistics. Reid’s research focuses on finding more accurate and efficient methods to deduce and conclude facts from complex data sets to ultimately help scientists find specific solutions to specific problems. As chair of the Natural Sciences and Engineering Research Council of Canada’s Long Range Plan Steering Committee for the Mathematical and Statistical Sciences, she has helped to set a course for research funding strategies and to promote mathematical and statistical sciences for years to come. 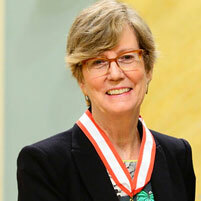 In 2015, Reid received the Order of Canada, was elected a foreign associate of the National Academy of Sciences in 2016 and has been awarded many other prestigious statistical and science honors. "It’s always a great pleasure to visit the Department of Statistics at CMU, and I’m honored to present this lecture in Morrie’s memory," said Reid. Reid’s DeGroot lecture kicks off the Department of Statistics’ 50th anniversary celebration events during CMU’s Carnival Weekend. A reception will follow Reid’s talk in the Rachel Mellon Walton Room in Posner Hall. And on Friday, April 21, a student poster session and reception will be held in Baker Hall 232.